This is just a quick note that my Austin Market Dashboard has now been updated to include final data through January 2011. The theme this month is that the Austin/Central Texas real estate market remains unpredictable — although virtually all economic indicators and forecasts call for improvement in our local economy generally, and our real estate market specifically. We are not likely, however, to just “turn the corner” and find ourselves on a steady path to recovery. In most cases, I expect to see year-over-year trends to be visibly upward, even as month-to-month market performance remains spotty. 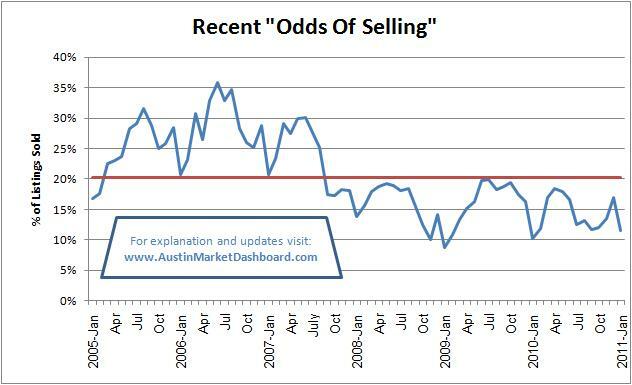 January 2011 marked the fourth time in 39 months that the “odds of selling” has reached 11% or lower. In all previous downturns over the past 20 years, one or two dips to the 10% range signaled the beginning of our next growth cycle. There’s much more information and discussion at www.AustinMarketDashboard.com. Feel free to visit and let me know if you have any questions or comments. « How are Texas cities performing economically?